BEASTO BLANCO, the band fronted by long time Alice Cooper bassist Chuck Garric, will release their self-titled, full-length second album on November 25, 2016 via Rat Pak Records. Beasto Blanco is the followup to the band's 2013 release Live Fast, Die Loud (Rat Pak Records) which was endorsed by the likes of movie actor Johnny Depp, IRON MAIDEN drummer Nicko McBrain, producer Bob Ezrin, and many more. The effort, which was produced by Ryan Greene (ALICE COOPER/LITA FORD/MR. BIG), features 11 new tracks and an amped-up cover version of Alice’s hit song “Feed My Frankenstein” that also features Alice's daughter and fellow BEASTO band mate Calico Cooper. The album is currently available for pre-order via Rat Pak Records website HERE. 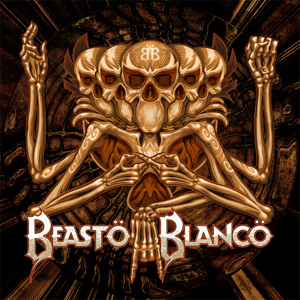 The first single from Beasto Blanco, the band’s version of “Feed My Frankenstein”, can be heard on the “Nights With Alice Cooper” radio show, which is syndicated on over 100 stations worldwide. The song can also be heard at 15,000 AMC, Regal, Cinemark and NCM movie theaters in the United States throughout the month of November. Influenced by bands such as WHITE ZOMBIE and MOTORHEAD, BEASTO BLANCO’s all new 12-song, sophomore release is a potent mix of heavy riffs, driving bass and melodic choruses. “I’m very proud of this release” says Chuck Garric, “This new album showcases the bands evolution as songwriters and our unity as a musical force” and Calico Cooper adds “This record is like a baseball bat to the chest that you want more and more of“.